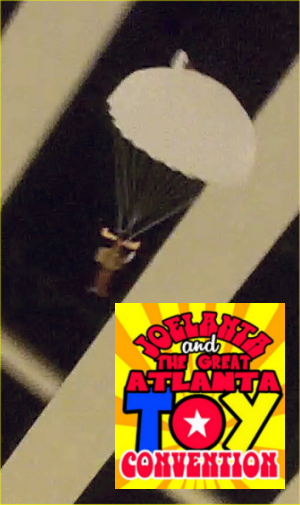 One of the highlights of JoeLanta and The Great Atlanta Toy Convention each year is the great action figure parachute drop. The Marriott Century Center in Atlanta, which plays host to the convention, has a fifteen-story high atrium in their lobby. The management and staff are very patient and generous and allow a convention full of slightly whacked-out toy collectors and their families to hijack their facility for one night during JoeLanta so that they can use this lovely atrium, surrounded on fifteen floors by balconies, as a launching and landing area for GI Joe and other action figures who have been outfitted with working parachutes. Think of it as a new kind of BASE jumping, with a much more manageable level of insanity. This video is six minutes of the best of the parachute drop, set to music performed by the legendary band of ’59, Big Daddy. Camera work is courtesy of Melanie Larch, Lee Harrah and your PopCulteer, who must apologize for being so far behind in getting our coverage of JoeLanta and The Great Atlanta Toy Convention posted in a timely manner. The truth is that I simply got hammered with emergency assignments as soon as we got back. I haven’t even had time to unpack and enjoy my goodies from JoeLanta yet. If I can get a break from crisis managment, the plan is to edit the wrap-up show and get the remaining panels and features posted over the next few days. Until then, enjoy the parachute drop!